From among Gail Albert Halaban’s photographs of Edward Hopper subjects: “House at Riverdale” (top). GLOUCESTER — Edward Hopper loved the houses here. The porches, the turrets, the mansard roofs, all offered ornate detail and complex shadow play. But even the simpler structures caught his eye. Walls lighted by the sun, the tidy sense of purpose and containment in a simple single-family home. For those who hunger to compare them with Hopper’s watercolors — and who won’t? They demand comparison — the museum provides a laminated gallery guide with reproductions. It’s not even close to seeing the paintings in person, and of course it’s a disappointment. But watercolors are fragile, and not readily loaned. Ronda Faloon, museum director, said in an interview that some are now on view in “Hopper Drawings” at the Whitney Museum of American Art. While the show necessarily pivots around Hopper, it takes a more expansive view, providing a detailed history of each building, portraying these structures as local characters witnessing the passage of time. Hopper caught them at a particular moment; Halaban captures them now. 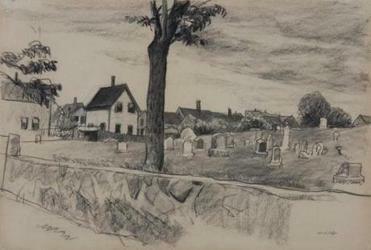 Edward Hopper’s “Cemetery in Gloucester” (above), a conte crayon drawing on paper from the Cape Ann Museum’s collection. Built in 1876, the Rocky Neck house Hopper painted in “The Mansard Roof” was originally occupied by Gardner K. Wonson, business manager at the Tarr & Wonson Paint Manufactory. It’s a gaudy extravagance, with dormers circling the roof providing a view of the entire neighborhood. “The Mansard Roof” is a charm: Wind billows through yellow awnings, posing the fancy that the house could take off in a stiff breeze. Windows in their elaborate frames point this way and that, winking with sunlight. Halaban photographs it at night, with all the windows glowing: House as magnificent beacon, a metaphor she fine-tunes by mounting her photographic transparency in a lightbox. A lone figure stands on the porch to the right, blurry perhaps due to a long nighttime exposure. That exposure also imbues the photo with a sweet, dusky light. Figures in all of Halaban’s images, often indoors, suggest the inward quality native to the characters we know from other Hopper paintings, such as “Nighthawks” and “Automat.” One of the photographer’s earlier projects focused on windows in New York — the people inside them, the folks across the way. Those convey a peculiar balance between voyeurism and neighborliness; there’s a sense of community. The “Hopper Redux” photos strike a more isolated note. Hopper didn’t include figures in the paintings Halaban takes off from, only buildings. Those watercolors were about light, structure, color, and the breezy spontaneity of his medium. Halaban’s houses feel more rooted, more permanent. Theatrically beautiful, they feel more psychologically fraught than Hopper’s Gloucester buildings. The museum invited Halaban to photograph the site Hopper depicted in the drawing from their collection, “Cemetery in Gloucester.” You can sense, in the fluid sketch in conte crayon, the artist keenly feeling his way through form and composition. It’s not known if Hopper ever painted the scene. 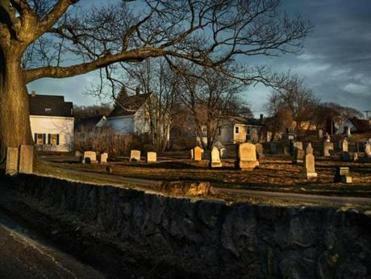 In Halaban’s photo “Poplar Street Cemetery,” the tree in the foreground is now a hollowed-out stump, but the gravestones haven’t changed. Nor have the modest houses along the perimeter. These houses, erected after the Civil War, housed laborers and fishermen when Hopper visited. In Halaban’s image, shot in the long sun just after dawn or just before dusk, a solitary figure stands in the warm light of one window, almost hidden behind a scrim of winter branches. Hopper ravished his subjects with sunlight. Halaban does that, too, occasionally — her version of the yellow, Italianate “Anderson’s House” soaks up an evening sun — but she has particular skill with artificial lighting, pouring from windows at night, or, in “House at Riverdale,” sparkling in dangly white holiday lights along the front porch, where a contemplative man leans on the railing. Inside, the lights are on too: We glimpse a woman walking down stairs. Pole’s Hill, a massive promontory, rises behind the house, almost monstrous in the evening dark. 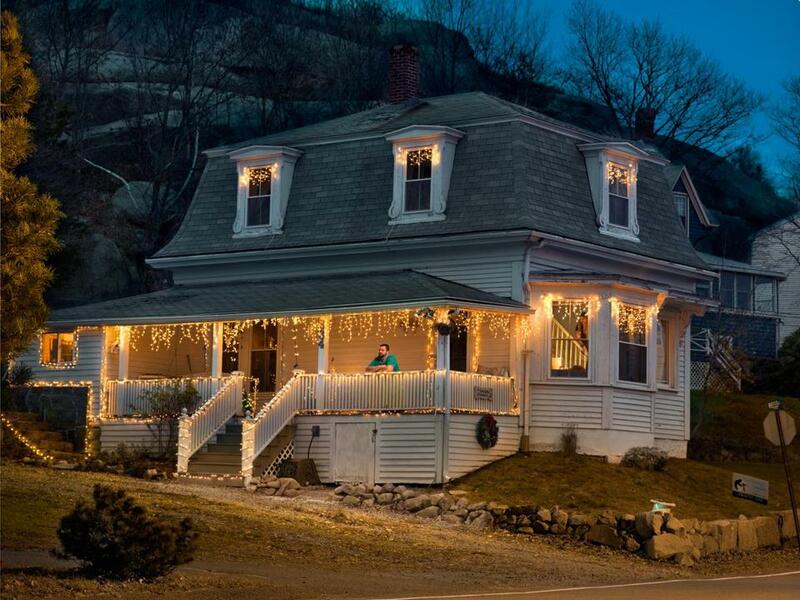 Hopper’s is a cheerier version; the house appears to nestle against the granite hill. The sharp contrast between Hopper’s houses and Halaban’s prompts a crazy hope that 90 years hence, another artist will stop through Gloucester, and see the same places again through yet different eyes.